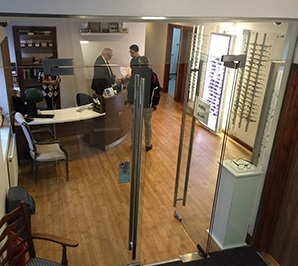 Our aim is to meet all your eyes need, through our EyeCare, EyeWear and Contact Lens departments. Our central London Eye Centre has been established since 1993 and holds a current database of over 21,000 patients and growing. As an independent practice, we focus on quality of care and over the past 20 years we are proud and honored to be serving the local and international community. Another aim for our company is to provide eye care services for less advantaged people, through our charity ‘all eye care foundation’. We encourage all people who are having any particular problem with their eyes &/or vision, to perform an eye exam without delay. It may be that glasses are required, however it could be something more urgent, requiring hospital attention. In either case, it is not worth risking and we are happy to cover the costs of the examination and any treatment that may be required. The health of your eyes can make a big difference to the quality of your life. Certain problems like Glaucoma or Diabetes can cause irreversible damage to the eye, even before a person notices any symptoms. This is one of the reasons why we recommend performing regular eye examinations, whether or not experiencing any particular issues.National Guidelinesfor intervals between examinations vary for people, however should not exceed 2 years. Our professional team of Ophthalmologists, Optometrists and Contact Lens Specialists are here to provide the highest quality of service available. We have spared no expense to obtain the latest technological equipment to aid in diagnosis and treatment. We have a short-list of approved EyeCare Products, which we sell online for your convenience, however we always advise that you should have your eyes checked by a professional, should you have any doubts or concerns. If you have any questions, you can contact our specialists directly, or you may be able to find the answers you are looking for under our common eye conditions or FAQs sections. Whether you are looking for glasses or sunglasses, you can choose from our extensive range of luxury eyewear. Use our virtual mirror to help you choose the right look and if you need any further convincing, reserve the glasses to try on in person at our Eye Centre. The current brands that we stock include Tom Ford, Gucci, Hugo Boss, Fendi, Michael Kors and Prada. Glasses can be purchased with or without prescription lenses. The lenses are glazed by our highly skilled technicians, who ensure the glasses are custom-made according to your prescription. We can carry out same-day repairs and can also make emergency pairs at short notice. Call us or just come into our practice and our team will be delighted to assist you. Buying contact lenses at great prices and having them delivered next day to your door is the best thing since sliced-bread (for contact lens wearers ;). We supply all type of lenses from the leading manufacturers, including Johnson & Johnson, Cooper Vision, Bausch & Lomb and Ciba Vision. In the UK, Contact Lenses are classified as medical devices, as wrong lenses &/or improper use, can have harmful effects on the wearer’s eyes. This is the reason we only supply contact lenses to those who have a contact lens prescription. We perform complimentary contact lens fittingsat our Eye Centre with any purchase of contact lenses. Alternatively, we can easily obtain your prescription from the last place you had your contact lens check-up.